When plants moved from water onto land, everything changed. Nutrients were scavenged from rocks to form the earliest soils, atmospheric oxygen levels rose dramatically, and plants provided the food that enticed other organisms to expand across the terrestrial world. Building on the success of a meeting in 2010, the New Phytologist Trust organised a multidisciplinary symposium bringing together scientists from a wide range of backgrounds, from geology to molecular biology to plant physiology, to discuss how plants colonised the land and the effects this had on the history of our planet. This meeting, the 38th New Phytologist Symposium (38th NPS) entitled ‘Colonization of the terrestrial environment 2016’, brought researchers from around the world to Bristol, UK, to reflect on recent discoveries, exchange new ideas, and highlight future research questions to be addressed. Plackett and Coates (2016) summarise the exciting insights and challenges discussed at the 38th NPS in their meeting report, published in New Phytologist. While animals crawled and scuttled their way onto dry land many times, all land plants evolved from a single common ancestor, a multicellular species of green algae that left the ocean around 470 million years ago. Land plants (embryophytes) have had to adapt to new environmental stresses; aside from the risk of drying out, terrestrial plants are exposed to damaging UV-rays from the sun and had to develop systems to transport nutrients and water against the pull of gravity. It was recently suggested that the embryophytes arose from a single algal species because it already possessed some of the traits needed to allow plants to survive on land. At the 38th NPS, Ned Friedman discussed the importance of various evolutionary innovations in plants during his keynote address. Around half a billion years ago, a massive increase in the level of atmospheric oxygen helped animals to diversify across the planet. Tim Lenton provided the 38th NPS delegates with new evidence that this oxygenation was a result of the photosynthesis of the newly evolved embryophytes, not ancient forests or cyanobacteria as previously thought. (Watch Tim Lenton’s keynote presentation here). As plants expanded onto the land, the levels of atmospheric O2 began to increase to reach modern levels, while the atmospheric CO2 declined. Credit: Plackett and Coates (2016), New Phytologist. Plants often grow with a little help from their fungal friends, and ancient embryophytes were no exception. Some of the earliest fossils show evidence of symbiotic relationships between plants and fungi, with fungi scavenging for scarce nutrients in return for carbohydrates produced by the plant. Until recently, the first fungi to associate with plants were believed to be the Glomeromycota; however, 38th NPS poster prize winner Katie Field (University of Leeds) presented new evidence for a symbiosis involving an even more ancient group of fungi, the Mucormycota. Another speaker, Francis Martin (whose presentation can be watched here), urged attendees, “Don’t forget the fungi!”, reporting that these plant-fungi symbioses have influenced the evolution of fungi too. The earliest plants had a huge environmental impact on the rocky shore. As Paul Kenrick, Lyla Taylor and Andy Ridgwell discussed (click their names to view their presentations), land plants pulled nutrients out of the bare rocks, increasing weathering and resulting in the first soils. Derek Vance (presentation available here) informed the 38th NPS delegates about the exciting new tools to reconstruct historical biogeochemistry and give us an insight into the impacts of the earliest land plants on their new environment. Isabel Montanez discussed how, later, the emergence of tropical forests began to influence the regional climate and the cycling of water through the environment (view her presentation here). 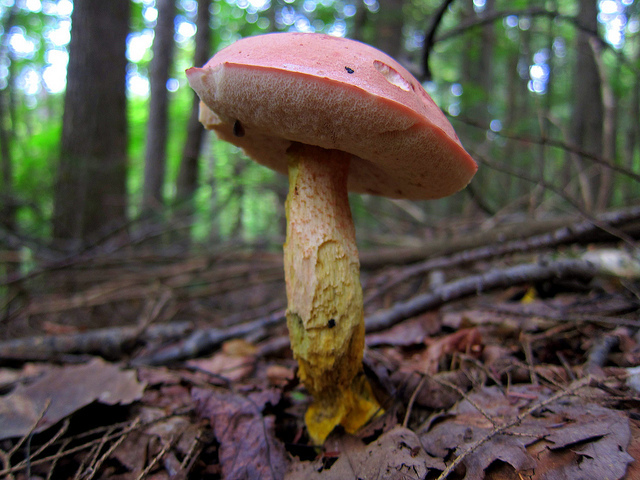 Mycorrhizal fungi such as this Tylopilus chromapes form a symbiotic relationship with plant roots, obtaining nutrients for the plants in return for carbohydrates produced during photosynthesis. Credit: Charles de Mille-Isles. Used under license: CC BY 2.0. Examining the relationships between plant species helps us to understand how genes and organisms evolve. 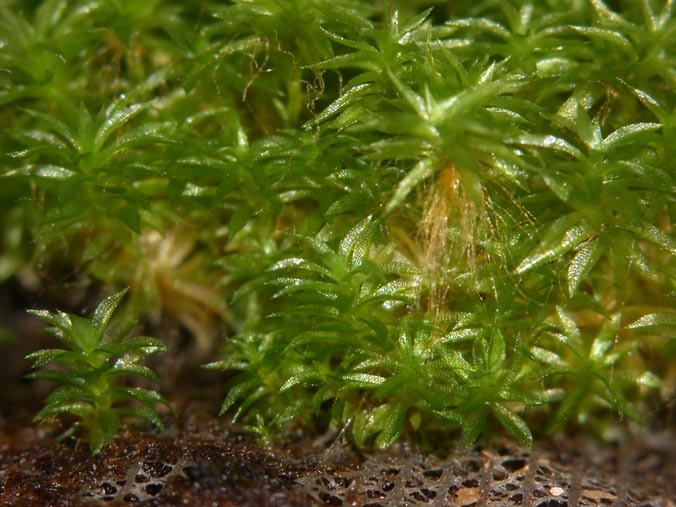 The bryophytes, which includes the liverworts, mosses and hornworts, are the most simple land plants. 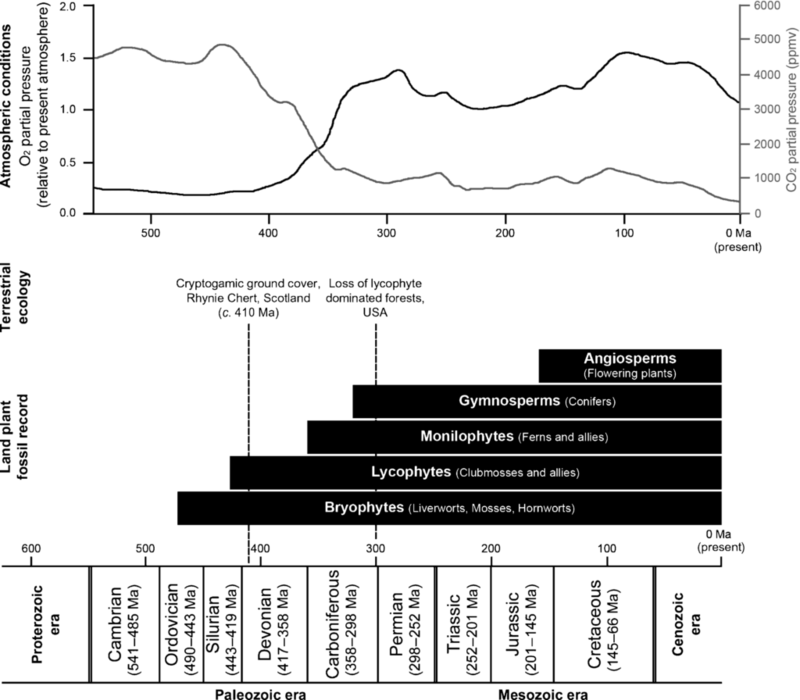 Until recently, the liverworts were believed to be the most basal group; however, new information presented to the 38th NPS showed things aren’t as simple as they seem, and the relationships between the bryophytes is still under debate. (Watch Sean Graham’s presentation on the phylogenetics of the land plants here). By studying the genes of the most simple plant species, we can begin to understand how the evolution of developmental processes has resulted in the huge array of plant forms. This topic, evodevo, was recently discussed at the New Phytologist Symposium ‘Plant developmental evolution’, which you can read about here. Julie Gray described how processes known from higher plants can be found and investigated in lower plants such as the moss Physcomitrella patens, allowing us to explore the similarities and differences between very distantly related species and understand how important embryophyte characteristics may have evolved (view her presentation here). Kevin Boyce reminded attendees of the 38th NPS that basing our assumptions of fossil plants on modern ecosystems can be very misleading, and that it’s important to take both the form and function of ancient plants into account to understand ancient ecosystems (presentation available here). Bryophytes like this Physcomitrella patens were some of the earliest land plants to evolve. Credit: Image is in public domain. A lot of progress has been made since the first New Phytologist Symposium on the plant colonisation of the land, but some of the most exciting questions are still unanswered. Why did that one lineage of algae succeed on the land where others failed? What drove the early diversification, and what gave rise to the vascular plants that dominate modern landscapes? One of the most pressing issues discussed by the 38th NPS attendees was the need for new insights into species from less well understood groups. For example, we still have not sequenced the genome of any fern species, leaving us with a huge gap in our understanding of this important group that bridges the gap between the bryophytes and the seed plants. You can watch all of the presentations mentioned here (as well as much more!) on the New Phytologist Youtube channel. A profile of poster prize winner Katie Field is available here. To find out more about the exciting research and future challenges discussed at the 38th New Phytologist Symposium, read the meeting report from Plackett and Coates (2016) in issue 212:4 of New Phytologist or check out the Wakelet of the event below. This entry was posted in Latest Posts, New Phytologist, Symposia and tagged climate, colonisation, ecosystem, embryophyte, evolution, fungi, New Phytologist, plant science, symposium. Bookmark the permalink.